During a rehearsal of one of his plays, Oscar Wilde quarreled with Sarah Bernhardt over how her part should be played. At an impasse, Wilde asked, “Do you mind if I smoke?” “I don’t care if you burn,” quipped Bernhardt. After all, we wrote the book on advertising law. 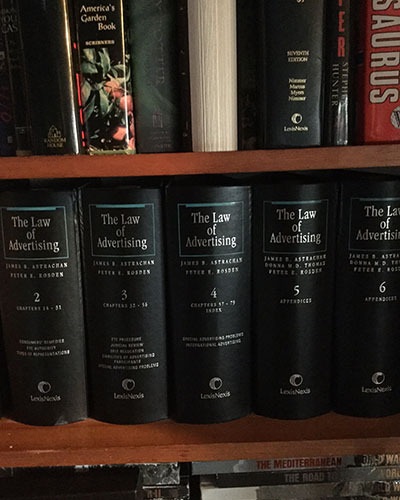 Six volumes, actually, published by LexisNexis® Matthew Bender®, The Law of Advertising and Mass Communications. If you are in-house counsel with marketing oversight, likely our treatise is on your shelf or used by you online. Astrachan Gunst Thomas prides itself on developing innovative and practical solutions for our clients in the advertising, marketing and communications industries. We represent clients in these industries from all over the country, big and small, public and private. Our clients' ability to succeed and in some circumstances to survive often depends upon the speed and quality of legal services. We counsel our clients on emerging advertising methods and the acquisition, protection and exploitation of proprietary technology, software, and business information. We counsel on what they can and can not claim. We help clients create and protect great, non-infringing ads (from time to time, some of us have even provided copy!). Astrachan Gunst Thomas’ attorneys teach copyright, trademark, unfair competition, sports and entertainment, trade secret and media and mass communications law at law schools and for other groups, including judges and chapters of the Association of Corporate Counsel. They are active in advertising trade associations and serve on the American Association of Advertising Agencies (AAAA) Legal Advisory Committee.